Heat oven to 375°F. Spray an 8-inch square cake pan lightly with cooking spray and line with two sheets of parchment paper crisscrossed with overhanging edges by a couple inches. Lightly spray the paper with more cooking spray. Set aside. Place the SunButter, sugar, cocoa powder, eggs, vanilla, and salt in a food processor and process until fully combined and smooth, scraping down the sides of the bowl as needed. Pulse in the chocolate chips, dried cherries, and pumpkin seeds. Scrape the mixture into the prepared pan, smooth the top with a spatula, and bake for 25 minutes or until set. Place the pan on a wire rack and let cool. 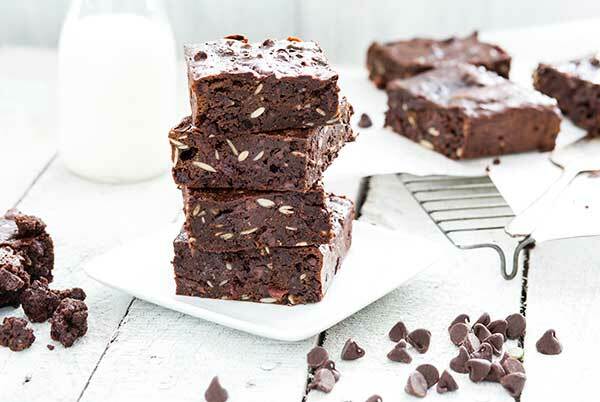 Remove the brownies from the pan and cut into squares.